An interesting article about how the wireless sensors industry is projected to grow from the current half billion dollar market (2011) to $2 billion in the next 10 years (2021). Your K9 units work hard, and are regarded as part of your team. Its a fact that we are seeing some of the hottest temperatures in history. With these heat waves, wouldn’t it be nice to know that your K9 Unit and Kennel are at an acceptable temperature? Monnit provides a solution for monitoring the temperature inside the vehicle kennel as well as on the dogs collar or harness. With Monnit WIT Wireless Temperature Sensors you can be notified immediately if the cooling unit in the kennel fails for any reason or if the temperature around the dog is too hot. The system also provides a detailed report as well as spreadsheet export functionality. Make sure that your Best Friend and Team Member is kept safe by using Monnit wireless sensors. Beat the Heat, with Monnit wireless sensors. In order to get the best performance out of your Monnit WIT Wireless Sensors, it is important to note proper antenna orientation and sensor positioning. Antennas should all be oriented in the same direction, pointing vertically out of the sensor. If the sensor is mounted flat on it’s back on a horizontal surface, you should bend the antenna as close to the sensor housing as possible giving you the most amount of antenna pointing vertical. You should make the antenna wire as straight as possible, avoiding any kinks and curving of the wire. For optimum signal strength determine the height at which the majority of your sensors will be mounted at and position the wireless gateway at the same height. The sensor signal strength will reduce if the sensors are positioned higher than the wireless gateway. Also sensors should be at least 3 feet away from each other and the wireless gateway to function properly. Antennas should all be pointing vertically and devices should be at least 3 feet apart. Monnit Corporation (http://www.monnit.com) and iMetrik M2M (OTCBB:IMEK) (http://www.imetrikm2m.com) announced today a partnership that will enable them to offer the Machine-To-Machine (M2M) market a plug-and-play, end-to-end, cellular enabled wireless sensing solution. Using Monnit’s wireless sensors and iMonnit web application, and iMetrik’s M2M Cellular Gateway with global connectivity, users will benefit from a system that eliminates development time and reduces installation to an absolute minimum. The system will comprise Monnit’s battery operated low-cost wireless sensors collecting information, transmitted wirelessly through the iMetrik M2M Cellular Gateway via the iMetrik global GSM network and iMonnit web application. Once installed, a user can access the sensor data, and monitor any asset from anywhere at anytime through a computer or smart phone with Internet access. 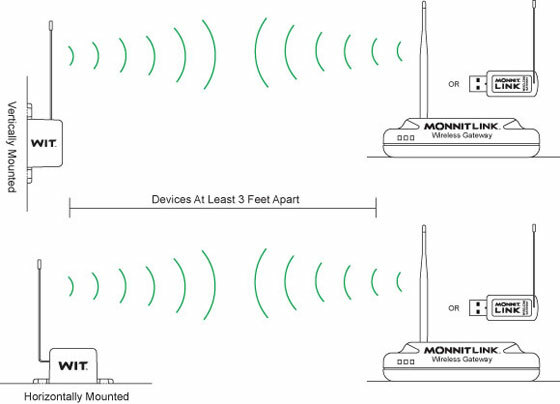 For more information about Monnit and its wireless sensors, call (801) 561-5555 or visit: http://www.monnit.com. Monnit is a leader in the design and manufacture of turnkey, self-installing, low cost wireless sensor solutions targeted at the commercial, industrial and consumer markets. Monnit’s sensing solutions are designed to be easily installed and used by anyone wanting to remotely monitor information and activities, including: access, presence of water, light, temperature, humidity, and vibration in or around structures, machinery, and various environments. For more information about Monnit visit, http://www.monnit.com.